Bzdek, Vincent (2008). Woman of the house : the rise of Nancy Pelosi (1st ed.). Palgrave Macmillan. ISBN 9780230610873. Dabbous, Yasmine; Ladley, Amy (June 2010). "A spine of steel and a heart of gold: newspaper coverage of the first female Speaker of the House". Journal of Gender Studies. 19 (2): 181–194. doi:10.1080/09589231003695971. Marcovitz, Hal (2009). 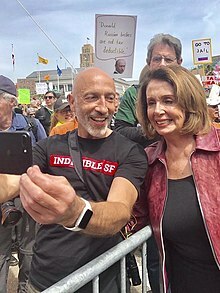 Nancy Pelosi : politician. Chelsea House Publishers. ISBN 9781438120423. McElroy, Lisa Tucker (2007). 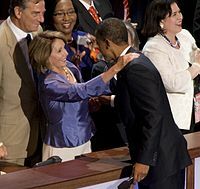 Nancy Pelosi : first woman Speaker of the House. Lerner. ISBN 9781580136280. 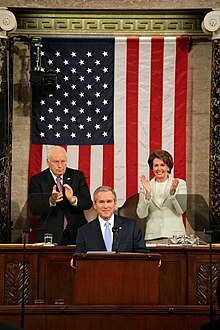 Pelosi, Nancy; Hearth, Amy Hill (2008). Know your power : a message to America's daughters (1st ed.). Doubleday. ISBN 9780385525862. Peters, Jr., Ronald M.; Rosenthal, Cindy Simon. 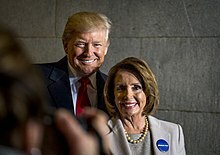 Speaker Nancy Pelosi and the new American politics. Oxford University Press. ISBN 9780199750764. Povich, Elaine S. (2008). Nancy Pelosi : a biography. Greenwood Press. ISBN 9780313345708. Rafter, Dan (2015). Female Force: Nancy Pelosi. StormFront Entertainment. ISBN 9781311355287. Sandalow, Marc (2008). 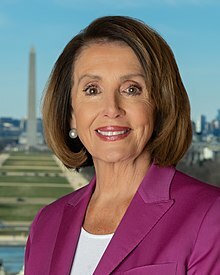 Madam speaker : Nancy Pelosi's life, times, and rise to power. Modern Times. ISBN 9781594868078. Shichtman, Sandra H. (2007). 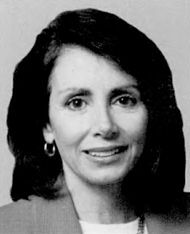 Political profiles : Nancy Pelosi. Morgan Reynolds Pub. ISBN 9781599350493. Schweizer, Rochelle (2010). 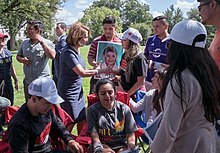 She's the boss : the disturbing truth about Nancy Pelosi. Penguin. ISBN 9781101443514.